Nokia is expected to announce six devices at its October 22 event, and one of them we might be seeing is the Nokia Lumia 1320 Windows phone. The first we heard was from evleaks, who first tweeted that the "Batman" codename was being used for the Lumia 1320 although didn't elaborate further. This was followed up when sources speaking to The Verge said that the handset will be the top low-end Windows Phone with specs comparable to the Lumia 625. Nokia is reportedly packing the 1320 with a large screen in the same vein of the 625, while the Dark Knight will also include a 5MP rear snapper and front-facing VGA camera. 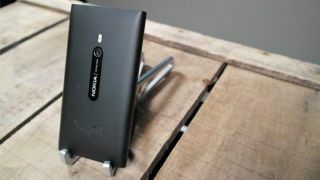 Nokia has done dealings with Batman before with a special bat-themed Lumia 800 to tie in with the release of The Dark Knight Rises - although there's no guarantee of a superhero tie-in come launch. We're expecting the Nokia Lumia 1520 phablet handset to be unveiled at the big Nokia event later this month, but what else has Nokia got up its sleeve? We'll either die heroes or live long enough to find out. Is the Nokia Lumia 1020 the camera phone you deserve, or the one you need right now?